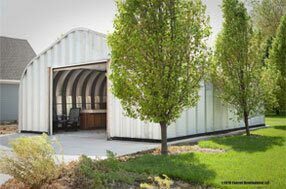 Georgia steel arch buildings & metal garage kits. 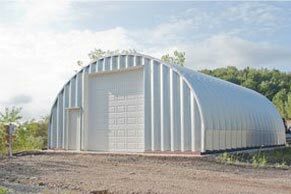 Metal garage kits and steel arch buildings custom designed and manufactured for Georgia counties. Georgia metal garage kits are engineered for the environment and geography of the Peach State and its coastal wind storm restrictions. Georgia is 59,425 square miles with over 10 million residents spanning 159 counties (second in the nation) statewide. Georgia metal garage kits are manufactured in sizes ranging from 150' wide by over 250' long and 40 feet high depending on the model you choose. 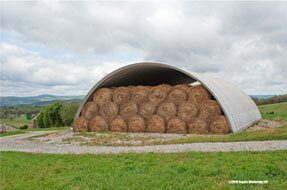 Georgia’s humid climate demands a good steel building ventilation system with turbine vents, and louvers as well as insulated panels are part of the steel arch system to reduce interior humidity and expel warm air. 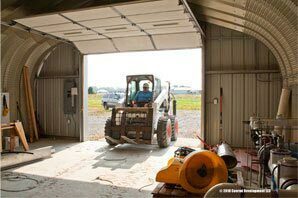 Garage doors for your southern building include walk through and overhead door selections. A 3'x7', 1.5" thich (3070/single leaf) walk through door and a motorized roll up door are overwhelmingly the Georgia consumers choice. The roll up door quickly retracts to prevent less cool air from escaping. 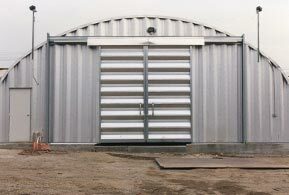 You can upgrade your walk through doors from the standard knock down to assembled commercial wind rated doors to 160mph. 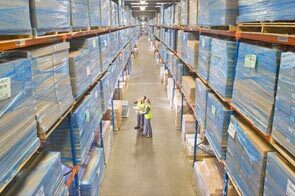 Textile industry companies in Alpharetta, Thomaston, and Atlanta value the security and mobility of building kits. You easily disassemble relocate and reassemble pre-engineered kits easily without losing any integrity of the structure and building quality. We manufacture and deliver Georgia metal garage kits to Atlanta, Columbus, Augusta, Savannah, Sandy Springs, Roswell, Johns Creek, Albany, Warner Robins, Alpharetta, Marietta and Smyrna to be distributed to towns and rural address throughout the state. Each garage kit and fabricated steel building is custom made for specifications in Georgia's building permit laws. 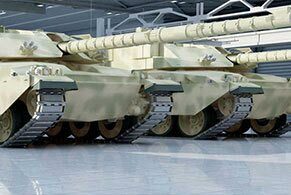 Our building kits are manufactured with 14 gauge steel, the thickest steel of any metal garage kit in the world. You can choose lighter gauges down to 22 gauge if you want a lighter building and lower cost. 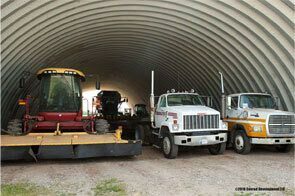 Metal Building Kings® steel garages are not tubular frames like cheaper versions that are available. 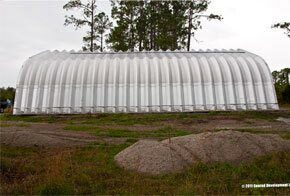 The Georgia metal building have 7½" deep corrugation and are engineered for maximum strength. and are made of Galvalume 80,000ksi tensile yield carbon steel coated with aluminum-zinc alloy. 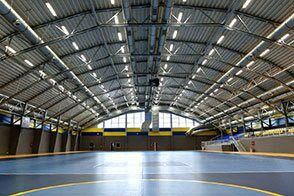 The strongest prefabricated structure in the United States. 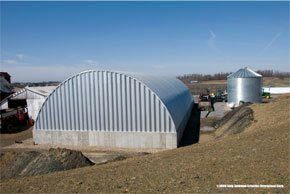 Metal Building Kings® garage kits and steel arch buildings are manufactured to meet the all Georgia certification standards and its wind velocity building codes, Georgia seismic building codes. A company cannot ship a modular building into the state unless it meets Geaorgia's codes. Strict code enforcement applies to Georgia counties along the east coast especially Collier County, Bulloch County, Chatham, Bryan, Liberty, McIntosh, Glynn and Camden counties where hurricane codes restrict the type of structure you can erect on your GA property. 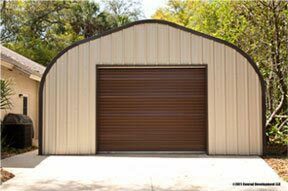 At Metal Building Kings® we custom build your Georgia metal garage kit steel arch building specifically according to all Georgia county building codes and its practical use. Design, price and buy your building in Georgia by using our price quote calculator or discount calculator or by calling our building support staff at 412-522-4797.